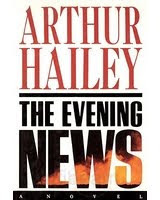 The Evening News is a book about the people driving the media world. It describes their professional as well as personal lives with a very descriptive and a moderate tone. The story starts with the happenings of the most popular news channel CBA News, and the people working there, Crawford Sloane, their anchorman, Leslie Chippingham , CBA news President, Rita Abrams editor, Harry Partridge, their best in class reporter, and several other people, responsible for the daily activities of the news channel. It takes a grip when Crawford Sloane’s wife and son got kidnapped, and then CBA starts searching them, for their best in class colleague, and of course to broadcast latest and the most happening event, ahead of others. The story moves on with the progress in search in a periodical manner, and in between the eclectic and the best in class guessing makes the pace for locating the victims. Hailey as usual, had been very descriptive in all the aspects of the story, and had beautifully and intelligently described the lives of the people in the E-Media. This book, though with its good story line fails to match with author’s other books-Wheels, Airport and Hotel. However, he had successfully described the lives of the people, which is the USP of his all the books. i'll buy it soon...nice review..